I love ice cream. I absolutely love it, but since I was diagnosed with celiac disease in 2010, my ice cream options have been limited. All it takes is one tub of cookies and cream ice cream to contaminate a whole ice cream shop for me. I’ve had people say they can clean the scoop for me, but for me, unless they open up a new container and sanitize the scoop – the damage has already been done. The scoop-cone connection is another risk of contamination. Most often I resort to buying a pint of gluten free ice cream and eating it at home, or I try to satisfy my urge with some soft serve, but it’s not the same. 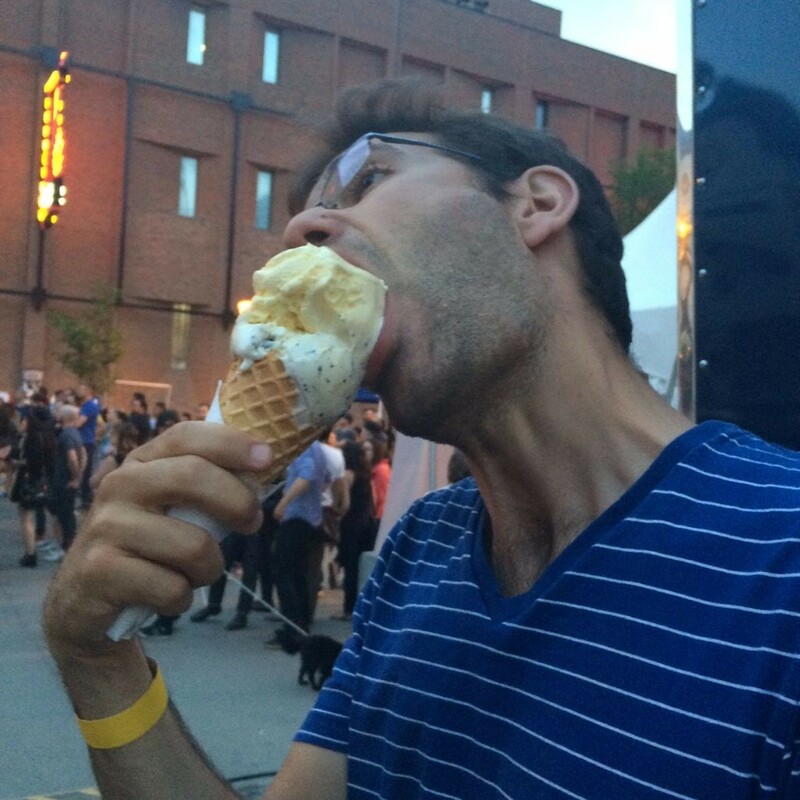 Back in May I was at a street party on 104th street when I spotted Keilan’s Creamery, a truck that was dishing up some pretty delicious looking ice creams on big waffle cones. I walked up to the window to see choices and saw an * saying they had gluten free options. There was a line so I poked my head in the back window and asked about the GF situation. A young guy asked me if it was an allergy or a preference. I said I had celiac disease. He responded that they had two choices that evening – Belgian hazelnut and coconut. I learned that they designate a couple of flavours each day that never come in contact with their cones and the scoops are sanitized before each serving to prevent cross contamination in the truck. The situation looked legit so we stood in line and when we got to the front, I watched the scoop was cleaned before the two flavours of Foothills Creamery ice cream were piled into a cup for me. And so was the Spaniard. He opted for the waffle cone and was all smiles with his super-sized serving. The next time I saw the Keilan’s Creamery food truck it was parked outside the University of Alberta Hospital, no less than 100 meters from my office. This time I had a chance to speak with Keilan about offering up a gluten free choice. He told me that with an increasing number of people with celiac disease, gluten allergies, and just a preference for GF – there was enough demand to warrant the extra step to provide a gluten free choice. He thinks everyone deserves a big scoop of ice cream on a hot summer day, and I couldn’t be happier that Keilan’s Creamery is providing a safe and tasty option for me. (And having that truck parked outside my office every Thursday throughout the summer has greatly improved my mood at work). Keilan and his crew are all university students and they will be heading back to school shortly. They are still going to be scooping it up for the next month, but if you want to hit up this ice cream truck you need to do it by October. Visit their website, check them out on twitter, or follow them on Edmonton’s food truck app for times and locations around the city. Previous PostPitstop in Torrington, Alberta? Gopher it!